Mia is now nine years old, and thriving in every possible way. In the early days, I shared posts via a private blog to update family and friends and that sustained me while Mia was in the NICU and I was commuting from home where Zoe, my then 2.5 year old was also needing my attention as she wondered, “Where is my baby sister? Why isn’t she home?” Coworkers offered me rides and meals, and even childcare for Zoe in those early days. Friends and family from further away sent moral support. I was working as a software engineer but had completed a Feldenkrais Method® professional training program prior to having children. In addition to starting Early Intervention services when Mia was one month old, she was in the hands of Sheryl Field, founder of The Field Center for Integrative Development from early days as I knew from my own experience that Feldenkrais would be essential to my daughter’s development. I may have heard of Children’s Hemiplegia and Stroke Association (CHASA) during Mia’s first year, but was reluctant to join. Based on my Feldenkrais training, I was focused on the best possible outcome for Mia, and didn’t understand the value of community. I only began to engage with the CHASA community as Mia approached twelve months. Her Early Intervention physical therapist recommended a hand brace for her affected right hand. From a Feldenkrais point-of-view, I was opposed to a hand brace. The brace would pull Mia’s thumb out but her muscles would contract more tightly against the brace and worsen her chronically tight and tucked thumb. I found CHASA, and learned about constraint therapy from another mother who turned out to live in a neighboring state, and shared her knowledge generously, including referrals to an orthotist, a physiatrist, and an occupational therapist specializing in constraint therapy. This mother and her daughter visited us, and handed-down many high-quality toys that promoted bimanual use and functional use of an affected hand and arm. 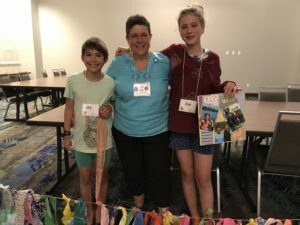 It was an amazing gift to make this connection first online, then later in person, to learn from a parent of an older child who was further along the journey. At that time, the CHASA community existed in a basic website and via a HemiKids listserv. I lurked, occasionally gleaning ideas about new toys, therapies, and possible struggles. After a few years, CHASA Facebook groups were added, and the community had many faces as families started to share photos and videos. In 2013, when Mia was four years old, I created this blog and wrote posts throughout the month of May to raise awareness about pediatric stroke. Through my writing, I connected with more families but it was still online, aside from that one mom from Maine. 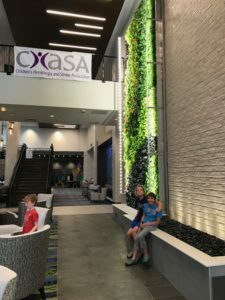 I knew that CHASA had family retreats, but when my children were young, the idea of traveling to a family retreat in a southern state in July didn’t seem feasible or appealing to me as a single mother. But, then the 2016 retreat site was announced. Lexington, Kentucky was close enough that we could drive. My kids were seven and nine years old, old enough to make the trip meaningful for them, and enjoyable for me. And it was in ways that I couldn’t have anticipated. My girls met other children from families impacted by hemiplegia or stroke. We all made friends, shared meals, swapped stories, and connected with about four hundred other people from families that had walked some part of our journey. We received and offered support and encouragement. Now, these CHASA family retreats are every two years. We were lucky that the 2018 retreat was planned for Denton, Texas, near where one of my brothers lives, so we again planned to attend, and combined the retreat with a family visit in Texas. We saw old friends and met new families, including a neuroscientist mom who now works at the U.S. Patent Office, families from all over the U.S. and even one that currently lives in Moscow, Russia. 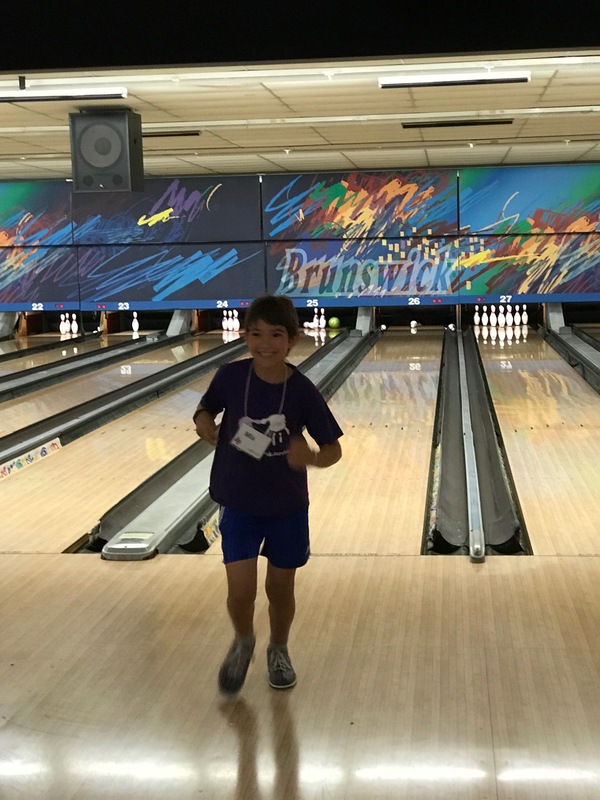 We met kids and young adults who have hemiplegia due to many different causes: stroke, brain tumor and surgery, hemispherectomy for intractible epilepsy, twin-to-twin transfusion with in-the-womb surgery. 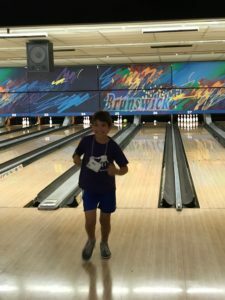 We took over a bowling alley as CHASA sponsored more than 100 kids in bowling, a fun activity that is possible with use of one hand, and doesn’t require a ton of walking. We swam with, played cards with, and danced with other families just like ours. We interacted with several service dogs. We heard a talk by and watched a demo of adaptive table tennis with paralympic hopeful, Danny Scrivano, taking on members of the North Texas University Table Tennis Team. We sat in a circle with tens of daughters and their moms talking authentically about aspects of growing up with hemiplegia, how to manage self-care with one hand, or limited use of a helper hand, how to deal socially with the real risk of seizures, how to advocate for independence within one’s family and in the wider world. We saw a demo of a glove that with gaming technology can improve one’s functional use of an affected hand. I participated in discussion groups on alternative therapies and alternatives to therapy. With 370 others whose lives and families have been changed by hemiplegia or stroke, we connected, learned, and dined together for seventy-two hours. And, perhaps most meaningfully to me, I was truly able to give back at this retreat. I taught a Feldenkrais lesson on turning and twisting. It was done in chairs and in standing. I invited people of all abilities, ages ten and up. Several kids and young adults with hemiplegia participated and noticed differences throughout the lesson and from side to side. Parents joined in too and felt how this way of attending to oneself can be of benefit. I shared a recording of the lesson with those in attendance at the retreat who were not up early enough for my 8 am class, and will gladly share with you if you contact me. Beyond this lesson, I taught a family with a child who is not yet crawling that it doesn’t serve their son to put him in sitting or standing before he’s ready. He’ll own his movement and move with higher quality if they can respect his developmental pace. We left the retreat hotel on Wednesday, grateful for all the new connections and sad to say goodbye for now. For the adults and teens, online connections will only be strengthened by this time spent in face-to-face contact. For the kids, they’ve made memories to last until the next national retreat or more local gathering. The Child Neurology Foundation has recently formed a Collaborative Peer Support Work Group to improve opportunities and access for peer support. As my family has personally benefitted from direct peer support, I heartily endorse these efforts and hope to attend their Peer Support Boot Camp on October 2, 2018. This entry was posted in Travel and tagged CHASA, community, peer support on July 13, 2018 by mara.